You are familiar with the statement, “Must be seen to be believed.” In the case of cherry blossom season, this is not an exaggeration. It is truly a take – your – breath – away experience to be ingested and savored. The attachment the Japanese and I have to Sakura cannot be overemphasized. 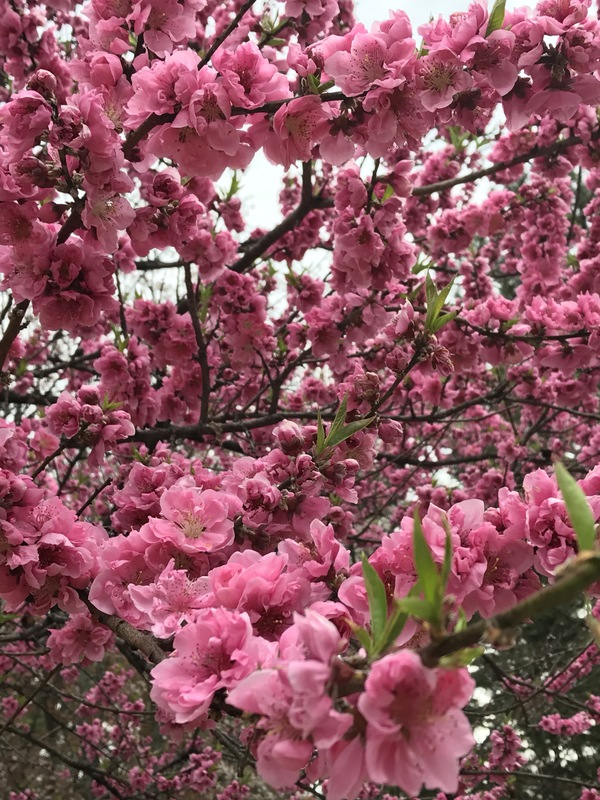 Weeks before the blossoms appear, forecasts appear, predicting when and where cherry blossom season will begin and spread across this island nation. The color pink appears in hankies and scarfs, cakes, drinks and candies. Artificial branches of pink cherry blossoms are hung in shopping arcades. Increasing numbers of kimono-wearing women appear on the street, adding to the sense of anticipation and sense of occasion. You would be forgiven if you thought that it’s all overblown, or if you’ve seen it one time, you do not need to see it again. You’d only think that if you had never truly experienced it. Sakura holds a unique place in the hearts and minds of the Japanese people. Much has been written about the centuries – long attraction of the blossoms to the Japanese. 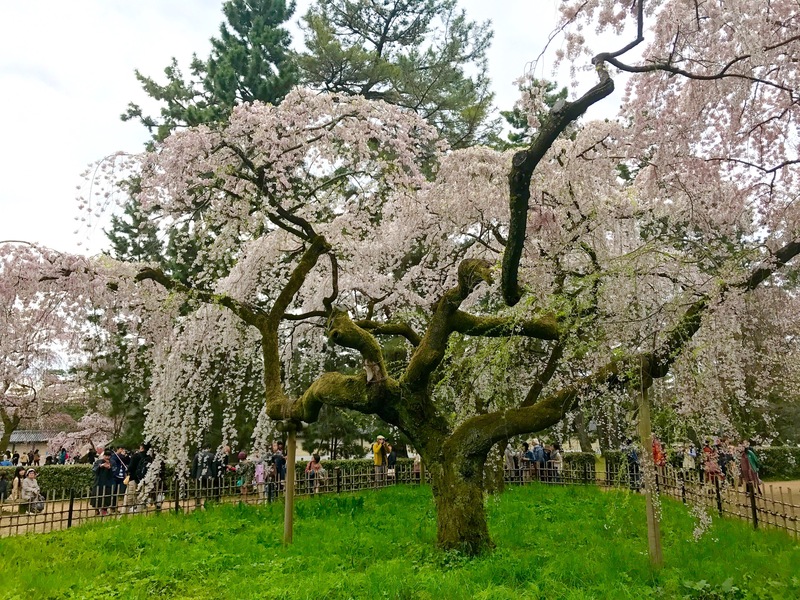 Now, 21st c. publicity and travel opportunities have contributed to an influx of tourists from many lands, poised to descend on the most famous places in Japan to view sakura. At times, in certain places, the crowds of people with camera phones become almost comical, if it weren’t so annoying. The masses of people can easily distract me from the magnificence of the trees in bloom. 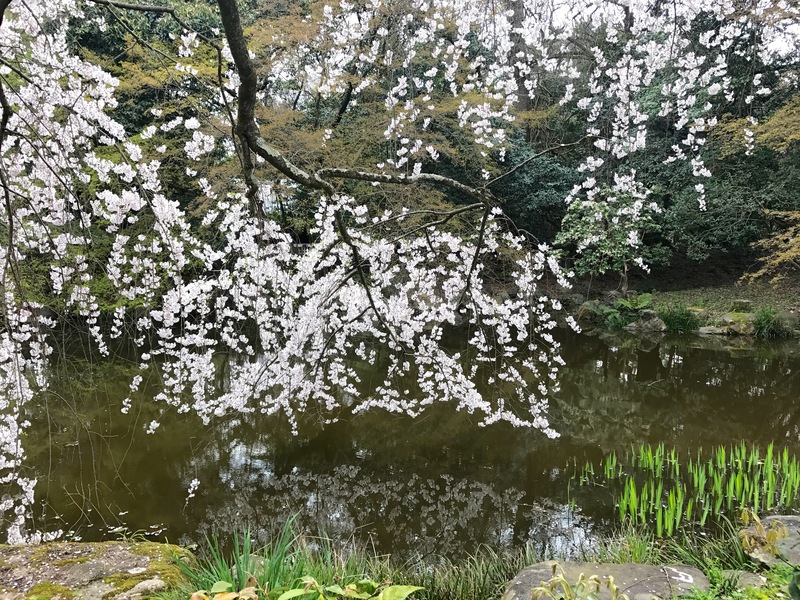 Yesterday, as the blooms intensified across Kyoto, we sought to view the flowers in a quieter location. I wanted to be sure my family saw what all the fuss was about before they headed for Tokyo. At the suggestion of a Japanese friend, we took our family inside the gates of the former Imperial Palace. Although we saw almost the identical scene at this place last year, I felt my heart opening to the beauty that surrounded us. Here, there were no food booths and no troops of tourists being led around by a hyped up flag-waving tour guide with the challenging job of keeping dozens of camera-wielding people moving, moving, moving. There were groups of local moms whose kids played happily at the playground while they chatted with each other close by, under the blooming trees. Another beautiful day in Kyoto. I immediately found myself putting my iPhone camera into quick action. Even though many think you can’t capture this glorious scene with a camera, I disagree. You can capture a small part of the scene, which will trigger memories for the person who took the photo, if not for someone viewing the photographs. With that in mind, I nevertheless am eager to share my ongoing dialogue with the cherry blossoms. 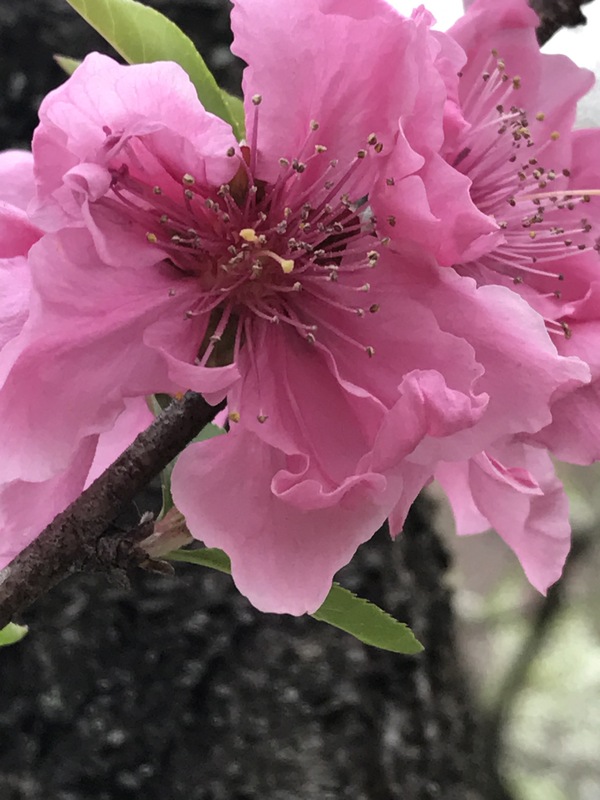 Upon visiting another friend of ours in Kyoto, who practices tea ceremony, I asked him why he thought it is that we never tire of seeing the blossoms. His smile was wistful and sweet as he patiently explained to me, that although our bodies weaken with time, our heart’s capacity to expand and take in beauty, constantly increases, so that it is really impossible to reach our limit. His words touched me deeply. Next Post My ( Granddaughter’s )Obsession with 7-Eleven! Beautiful picture of the two of you, as well as the explanation of beauty from your friend. Absolutely beautiful. The pictures as well as the writing.